Anthocyanins are water-soluble colored flavonoids present in multiple organs of various plant species including flowers, fruits, leaves, stems and roots. DNA-binding R2R3-MYB transcription factors, basic helix–loop–helix (bHLH) transcription factors, and WD40 repeat proteins are known to form MYB-bHLH-WD repeat (MBW) complexes, which activates the transcription of structural genes in the anthocyanin pathway. Although black cultivars of carrots (Daucus carota L.) can accumulate large quantities of anthocyanin in their storage roots, the regulatory genes responsible for their biosynthesis are not well characterized. The current study aimed to analyze global transcription profiles based on RNA sequencing (RNA-Seq), and mine MYB, bHLH and WD40 genes that may function as positive or negative regulators in the carrot anthocyanin biosynthesis pathways. RNA was isolated from differently colored calli, as well as tissue samples from taproots of various black carrot cultivars across the course of development, and gene expression levels of colored and non-colored tissue and callus samples were compared. 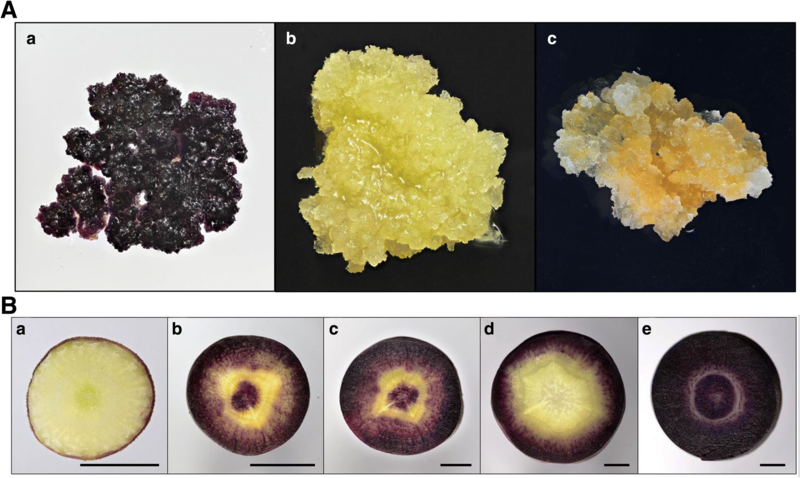 The expression of 32 MYB, bHLH and WD40 genes were significantly correlated with anthocyanin content in black carrot taproot. Of those, 11 genes were consistently up- or downregulated in a purple color-specific manner across various calli and cultivar comparisons. The expression of 10 out of these 11 genes was validated using real-time quantitative reverse transcriptase polymerase chain reaction (qRT-PCR). The results of this study provide insights into regulatory genes that may be responsible for carrot anthocyanin biosynthesis, and suggest that future focus on them may help improve our overall understanding of the anthocyanin synthesis pathway. Anthocyanins are water-soluble, colored flavonoids present in multiple organs of various plant species including flowers, fruits, leaves, stems and roots , and are responsible for the red, purple and blue colors . They have many biological roles, including attracting pollinators to flowers and seed dispersers to fruits, as well as conferring defense against plant pathogens, and protection against UV radiation, drought and cold [1, 3–7]. Anthocyanins have also been used as natural replacement of synthetic food colorants , and in recent years they have attracted significant attention due to its low toxicity  and health-promoting effects, such as protection against cancer, strokes and other chronic human disorders [2, 9, 10]. The biosynthesis of anthocyanins is one of the most extensively studied biosynthetic pathways of secondary metabolites in plants [11, 12]. The pathway is highly conserved across species, involving at least two classes of genes: the structural genes encoding the enzymes that directly participate in the formation of anthocyanins, and the regulatory genes that control the transcription of structural genes [2, 13]. Many of the structural and regulatory genes involved in anthocyanin biosynthesis have been identified, especially in flowers, fruit and leaves . In particular, regulatory genes likely play an important role in determining anthocyanin production, and studies suggest that the pathway is regulated by the interaction of three protein families: DNA-binding R2R3-MYB transcription factors, basic helix–loop–helix (bHLH) transcription factors, and WD40 repeat proteins [2, 15, 16]. These regulatory proteins form a ternary MYB-bHLH-WD40 (MBW) transcriptional complex, that binds to the promotor of target genes, activating the transcription of structural genes in the anthocyanin pathway [2, 16, 17]. 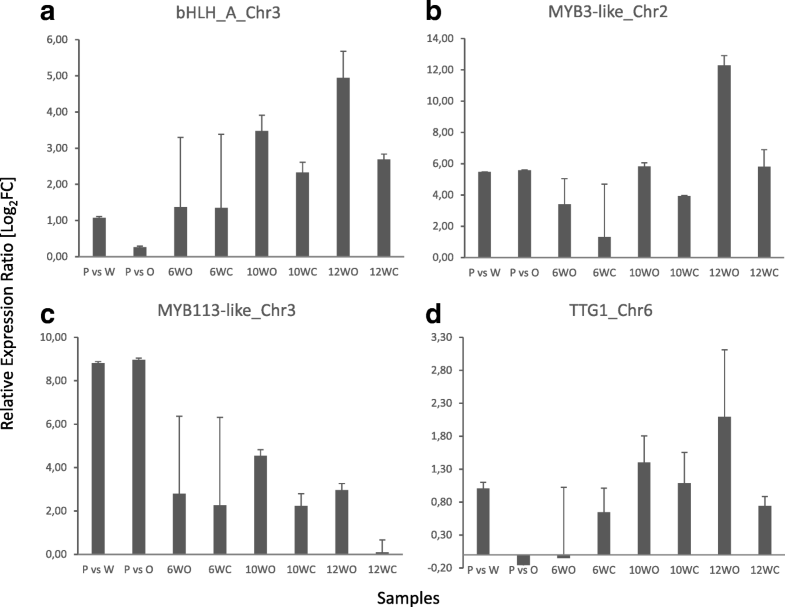 Transcription levels of MYB and bHLH differ among cell types and in response to environmental conditions , while the WD40 genes are likely to be transcribed constitutively . MYB transcription factors often play the key role in regulating anthocyanin production in various plant species, although a few studies have also found some important bHLH proteins regulating the pathway . Most of the MYBs involved in anthocyanin biosynthesis are positive regulators that enhance the expression of structural genes involved in the pathway. However, negative regulators have also been characterized, such as VvMYB4 and VvMYBC2 in grapes  and FaMYB1 in strawberry . Negative regulators interact with bHLH protein, thereby competing with the R2R3-MYB activators. It is known that different R2R3-MYB transcription factors control various flavonoid pathway branches leading to the biosynthesis of anthocyanins, flavonols, and proanthocyanins . R2R3-MYB homologs that are involved in anthocyanin biosynthesis have been isolated in various species, including apple (MdMYB10)  and pear (PcMYB10) , as well as many other members of the rosaceous family and other species . Carrot (Daucus carota L.) is one of the plant species that can accumulate large quantities of anthocyanin in its storage roots [14, 27]. Furthermore, black carrot anthocyanins are known to have higher color stability across a wider range of pH and temperature levels than those from other plant species . This, in combination with high antioxidant activity  and levels of nutraceutical components , has lead black carrots to be increasingly recognized as an attractive source of anthocyanin. Although Xu et al. have recently discovered that a gene encoding an R2R3-MYB protein, DcMYB6 (designated as MYB113 in ), is involved in regulating anthocyanin biosynthesis in black carrot taproots, the overall regulatory genes responsible for carrot anthocyanin biosynthesis are not well characterized, and key transcription factors such as bHLH and WD40 have not yet been identified. It has been shown that combined induction of MYB and bHLH proteins leads to high levels of anthocyanins in other plant species [24, 32, 33]; thus, if the aim is to increase anthocyanin biosynthesis in black carrots, it is of particular importance to identify the appropriate bHLH partner that forms the right functional MBW complex with DcMYB6. Unlike species in the rosaceous family, previous studies on carrots have attributed differences in anthocyanin accumulation to a handful of structural and regulatory genes that were already isolated and characterized [17, 27]. The current study aimed to analyze global transcription levels, and to mine MYB, bHLH and WD40 genes that may function as positive or negative regulators in the carrot anthocyanin biosynthetic pathway. RNA was isolated from differently colored calli, as well as tissue samples from taproots of various cultivars across the course of development. RNA-Seq data were obtained, aligned to the recently published carrot genome , and gene expression levels of colored and non-colored tissue and callus samples were compared. Overall we aimed to identify MYB, bHLH and WD40 genes that are consistently down- or upregulated in a purple color-specific manner within the various cultivars and different time points sampled. Our results add to the understanding of color variations in black carrot taproots, and allow identification of important regulatory genes that may be involved in anthocyanin biosynthesis. The analyses relied on three different data sets: 1) calli isolated from taproots of two different carrot cultivars, 2) taproots of a black carrot cultivar, CH5544, sampled at three different time points over the course of development, and 3) taproots of two black carrot cultivars, Nightbird and Superblack, sampled at one time point. RNA was isolated from these samples, and RNA-Seq data were obtained, aligned to the carrot genome , and differential expression analyses were performed using colored and non-colored tissue or callus samples. In addition, total anthocyanin content was measured from a subset of calli and taproot samples; the correlation between the anthocyanin content and the level of expression for differentially expressed genes was tested. Finally, genes correlated with anthocyanin content were validated with quantitative reverse transcription polymerase chain reaction (qRT-PCR). Four different types of cultivars were used in this study: Danvers, Nightbird, Superblack and CH5544. The seeds of the Danvers cultivar were purchased from Berlin Seeds LLC (item number: 251811505049). The seeds of the Nightbird cultivar were purchased from Plant World Seeds (catalog number: 4750). The CH5544 and Superblack cultivars are breeding lines originating from Chr. Hansen. Calli from the black carrot CH5544 (Daucus carota ssp. sativus var. atrorubens Alef.) and the orange carrot (D. carota var. sativus) cultivar “Danvers” were induced on hypocotyls cut into 1 cm explants. The explants were grown on solid B5-medium  supplemented with 1 mg/l 2,4-D and 30 g/l sucrose and subcultured every four weeks. For Danvers, only yellow to orange calli were induced (Fig. 1A), whereas the calli induced on CH5544 explants showed a mix of white to purple colors. After two subcultures, the white and the dark purple calli formed on the CH5544 explants (Fig. 1A) were selected and cultured separately for twelve months after culture initiation. Two colonies of purple, white and yellow/orange calli were selected for RNA extraction (Table 1). Taproots were obtained from the cultivars, Nightbird, Superblack and CH5544 (Daucus carota ssp. sativus var. atrorubens Alef. ; 2n = 2× = 18; Chr. Hansen A/S, Denmark); seeds of these cultivars were sown in peat (10–12 per 5 L pot) and grown in a greenhouse under 16 h:8 h light:dark photoperiod with ~ 120 μE m− 2 s− 1 (6480 lx) of light intensity and day/night temperature regimes on ~ 25/20 °C. The type of taproot tissue and number of individuals sampled from each cultivar are summarized in Table 1. Specifically, taproots were collected from eight CH5544 individuals at three different time points (6, 10 and 12 weeks after sowing) in order to capture genes that are expressed in a purple tissue-specific manner during the emergence to the full development of the purple color. Furthermore, taproots were collected from two Nightbird and 4 Superblack individuals at 12 weeks after sowing. Each taproot was sliced into a 0.2 cm disks along the horizontal axis, approximately 0.5 cm from the taproot’s top. The taproots of three cultivars exhibited differential pigmentation (Fig. 1B). For the CH5544 cultivar, the epidermis of all carrot discs was darkly pigmented (purple/violet), whereas the cortex was pigmented only in 10 and 12 weeks old roots. The pericycle and endodermis of 6-week-old carrots appeared slightly green, as compared to white/colorless in 10 and 12 weeks old carrots. The vascular taproot tissue was slightly green at 6 weeks and purple in 10 and 12 weeks old taproots. In Nightbird, the epidermis and cortex were darkly pigmented (purple/violet), while the rest of the taproot appeared white. For Superblack, the entire taproot appeared as dark purple, except for endodermis and pericycle. For CH5544 and Nightbird, the carrot discs were dissected into outer (epidermis + cortex), middle (pericycle + endodermis) and inner (xylem and phloem) tissue samples, whereas for Superblack, the carrot discs were dissected into only outer (epidermis + cortex) and inner (xylem and phloem) tissue samples (Additional file 1). All samples were immediately frozen in liquid nitrogen until homogenization. A subset of calli and taproot samples was collected for the measurement of anthocyanin content. Approximately 40 g of each sample was coarsely grounded and homogenized in a Waring® two-speed commercial blender (VWR - Bie & Berntsen, Herlev, Denmark) in a 3% sulfuric acid solution (1/1, w/w). The homogenate was subsequently mixed with 70% ethanol (1/2, w/w), vortexed and incubated for 1 h at room temperature. The supernatant was separated by centrifuging for 20 min at 4500 rpm and utilized for further analysis using high performance liquid chromatography-diode array detection (HPLC-DAD) and liquid chromatography coupled to (quadrupole) time-of-flight mass spectrometry (LC-MS/Q-TOF) as described in . Total RNA was extracted from the Nightbird and Superblack samples using 500 mg of frozen tissue per sample, using the Spectrum™ Plant Total RNA Kit (Sigma-Aldrich, USA) supplemented with 0.01 g/mL PVPP (Sigma-Aldrich, USA). Tissues were lysed with the Qiagen TissueLyser (Qiagen, USA) using 3 cycles of 30 Hz for one minute. The RNA extraction was hereafter performed following the manufacturer’s instructions. The total RNA recovered was further purified using the RNeasy Plant Mini Kit (Qiagen, USA) following the manufacturer’s instructions. DNAase treatment was performed to remove remaining DNA using the Ambion DNA-free DNA removal kit (Thermo Fischer Science, USA). For calli and taproot tissue samples of CH5544, total RNA was extracted using a modified protocol of Direct-Zol™ RNA MiniPrep kit (Zymo Research, USA). Approximately 500 mg of frozen tissue sample was homogenized in a sterilized (RNaseZAP, Sigma-Aldrich, USA) pestle and mortar with 6 mL of TRI Reagent (saturated with Gluta-thiocyanate, Sigma-Aldrich, USA). Total nucleic acid content was extracted by standard PCI (Phenol-Chloroform-Isomyl, Sigma-Aldrich, USA) extraction and precipitated with 96% EtOH (Sigma-Aldrich, USA). The RNA samples were purified with column purification, then subjected to DNAse treatment using the standard kit protocol. The samples were further cleaned and concentrated using the RNA Clean & Concentrator™-5 kit (Zymo Research, USA) following the manufacturer’s instructions, and finally eluted in 100 μl of DEPC (diethyl pyrocarbonate; Sigma-Aldrich, USA) water. For all samples, the RNA Integrity was verified by electrophoresis in 0.1% DEPC. The RNA concentration was determined using NanoDrop™ 2000 spectrophotometer (Thermo Fisher Scientific, USA). The cDNA libraries were subsequently prepared and sequenced using Novogene’s commercial service (Hong Kong, China) for calli and the CH5544 taproot samples, and BGI (Shenzhen, China) for the Nightbird and Superblack taproot samples. Paired-end 150 bp libraries with an insert size of 200–300 bp were sequenced on an Illumina HiSeq4000 instrument. Sequence quality of raw RNA-Seq data was assessed using FastQC v0.11.3 . Quality trimming was performed using PRINSEQ v0.20.4  to remove base pairs with a Phred score < 20 and trimming of poly-A tails > 8 bp. Sequences shorter than 55 bp, and all unpaired reads were excluded from subsequent analyses. The quality of trimmed sequences was checked again using FastQC v0.11.3. In order to identify differentially expressed purple color-specific genes, differential gene expression analyses were performed. First, trimmed reads from all samples were aligned to the reference genome published by Iorizzo et al. using STAR aligner  with default parameters. Aligned reads were used to generate a gene-specific count matrix across samples using featureCounts . Differential gene expression analyses were performed using several Bioconductor packages: namely, DESeq2 , EdgeR using glmLRT and glmQL models [41, 42] and Limma . Genes with an adjusted P-value or False Discovery Rate (FDR) < 0.05 found by these packages were considered as differentially expressed. MYB-, bHLH- and WD40-transcription factors are known to play essential roles in the transcriptional regulation of structural genes in anthocyanin biosynthesis. To mine candidate genes for these transcription factors, various color-specific and tissue-specific comparisons were performed to find genes that are differentially expressed in the purple tissue of taproot or callus. In particular, differential expression analyses were performed among the following comparisons: 1) purple, white and orange calli (Table 1), 2) outer purple and middle white tissue of 6, 10 and 12 weeks old taproot from the CH5544 cultivar (Table 1), 3) outer purple, middle white, and slightly green or purple inner tissue of 6, 10 and 12 weeks old taproot from the CH5544 cultivar (Table 1), 4) outer purple, middle white and inner white tissue of the 12 weeks old Nightbird taproot (Table 1), and 5) outer and inner purple tissue of the 12 weeks old Superblack taproot (Table 1). The degree of correlation between the total anthocyanin content and transcriptome abundance was examined for the MYB-, bHLH- and WD40-transcription factor genes detected by differential expression analyses based on multiple color- and tissue-specific comparisons. Specifically, Trimmed Mean of M-values (TMM) normalization  was performed on gene counts obtained from the 13 samples with measured anthocyanin content. Appropriate Box-Cox power transformation lambda values respectively to each gene were identified using the “boxcox” function implemented in the MASS package . 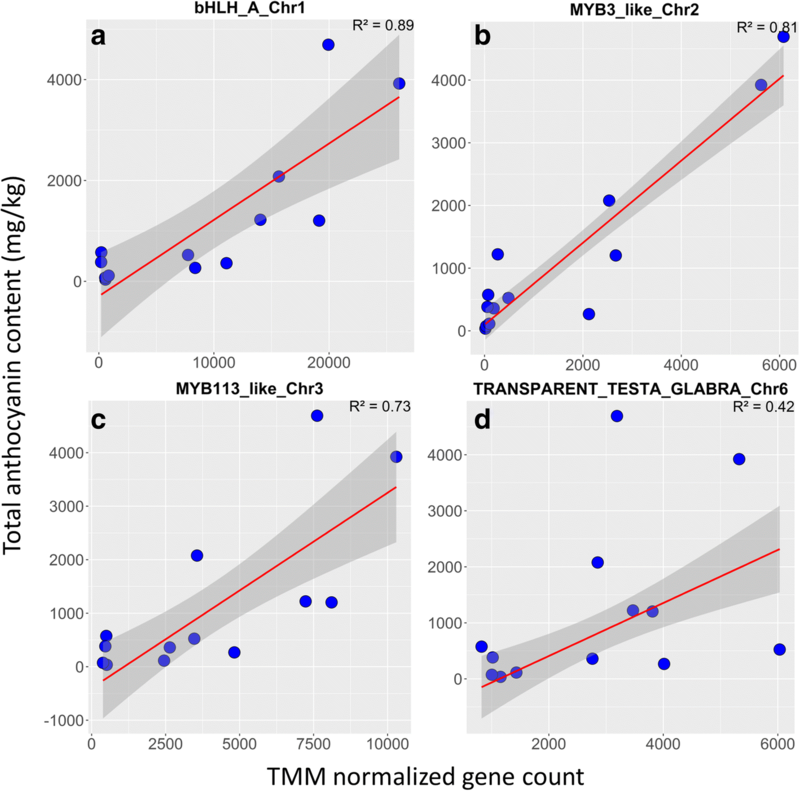 Linear regression was performed for each gene using the TMM normalized gene count and Box-Cox transformed anthocyanin content, with tissue type (callus or taproot) as a covariate to test for an association between the transcriptome abundance and anthocyanin content. The cDNA was prepared from the total RNA of all samples except for those from Nightbird and Superblack using SuperScript™ II Reverse Transcriptase (Thermo Fisher Scientific, USA). The standard procedure involved addition of 2 μl of Oligo(dT) primer (500 μg/mL) to 1 μg of eluted total RNA and heating at 72 °C for 5 min. The RNA mix was cooled to 25 °C and 48.5 μl of RT Master mix (according to the manufacturer’s instructions) was added, followed by heating to 42 °C for 45 min and 48 °C for 10 min in a thermocycler (Bio-Rad, USA). Primers for the 11 consistently up- or downregulated candidate genes were designed based on known carrot sequences (Kodama M, et al. : Genome-wide association analyses reveal candidate genes underlying anthocyanin biosynthesis in carrot (Daucus carota L.), In preparation) and sequence stretches present in NCBI Genbank, using Premier primer 5, (PREMIER Biosoft, USA) with amplicon length set between 75 and 153 bp (Additional file 2.1). Glyceraldehylde 3-phosphate dehydrogenase (G3PDH) was selected as reference gene using the primer set derived from . The primer pairs were subsequently analyzed for amplification specificity, efficiency and annealing temperature using endpoint PCR on synthesized cDNA. The qRT-PCR experiments were performed on a ViiA 7 Real-Time PCR System (Applied Biosystems, USA) using Power SYBR Green PCR Master Mix (Applied Biosystems, USA). A total reaction volume of 12 μl, containing 1 μl of previously diluted cDNA (1:10), 2.4 μl of gene specific primers (1.5 μM each) and 6 μl of SYBR Green PCR Master Mix was added to MicroAmp Optical 384-well reaction plate (Applied Biosystems, USA) and sealed with MicroAmp Optical Adhesive film (Applied Biosystems, USA). All samples were run in three technical replicates, and no-template controls were included in all plates. The qRT-PCR program was run for 40 cycles, each consisting 15 s at 95 °C and 1 min at 60 °C. The dissociation curve profile was analyzed by including an additional step of 15 s at 95 °C, 1 min at 60 °C and a constantly increasing temperature from 60 to 95 °C. The presence of a single peak from a melting curve from the last amplification cycle and single band in electrophoresis confirmed one single PCR product amplification for each primer pair. A total of 13 samples were measured for anthocyanin content (Table 2). While only outer or middle taproot tissues were sampled for most of the individuals examined, all three tissue types (outer, middle, inner) were measured for anthocyanin content for two individuals of the CH5544 cultivar sampled at 10 weeks old (Sample A and D). For both samples, the outer purple tissue contained a higher level of anthocyanin compared to the inner purple tissue (Additional file 3). The level of anthocyanin content was the lowest for the middle white tissue for both samples (Additional file 3). After the adaptor and low-quality sequences of pair-end reads were trimmed, a total of 1533 million clean reads were obtained, with an average of ∼34.9 million reads per sample. An average of ∼31 million clean reads per sample, corresponding to ∼89% of the total clean reads were uniquely aligned to the recently published carrot genome . Details on each sample are summarized in Additional file 4. A total of 104 MYB-, bHLH- and WD40-transcription factor genes were identified as differentially expressed at an adjusted P-value or FDR < 0.05 when comparing purple, white and orange callus. Specifically, 45 genes were identified as differentially expressed (DE) among all three comparisons, and 59 genes when comparing purple to white and orange calli (Fig. 2a; Additional file 5.1). 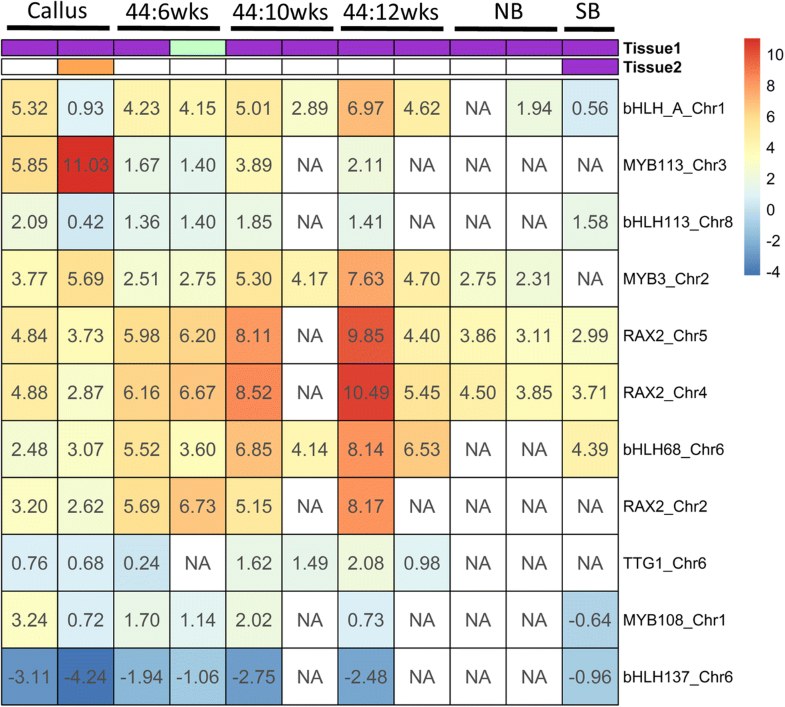 Of these, 36 genes were identified as DE when comparing the purple outer to middle white tissue in CH5544 sampled at the age of 6-, 10- and 12 weeks old (Fig. 2b; Additional file 5.2). Finally, 11 out of these 36 genes were identified as DE when comparing the purple outer and green/purple inner to middle white tissue in CH5544 sampled at the age of 6-, 10- and 12 weeks old (Additional file 5.2). Some of these genes were identified as DE when comparing the purple outer to white middle/inner tissue in Nightbird, as well as when comparing the purple outer to purple inner tissue in Superblack. Log-fold changes obtained from all 3 Bioconductor packages for all comparisons across various calli and taproot samples are summarized in Additional file 6. Although the focus of this paper was on MYB, bHLH, WD40 genes, several studies have suggested that bZIP and NAC genes may also play a role in regulating anthocyanin biosynthesis in other plant species [48, 49]. In this study, we have found a small number of genes that seem to be consistently up- or down-regulated in the purple callus and tissue-specific manner across multiple time points. Such results are summarized in Additional file 7. Of a total of 104 MYB-, bHLH- and WD40-transcription factor genes identified as differentially expressed in a purple color-specific manner, 32 genes were significantly correlated with anthocyanin content measured in a subset of callus and taproot samples (Additional file 5.3). A higher proportion of genes were significantly associated with anthocyanin content when genes were identified as DE across multiple comparisons. Specifically, when considering genes identified as DE across comparisons based on calli, as well as outer purple and inner purple/green to middle white tissue for the CH5544 taproot sampled at 6-, 10- and 12 weeks old, a majority of the genes were significantly correlated with anthocyanin content (9 out of 11 genes; Additional file 5.3). When considering genes identified as DE across comparisons based on calli and outer purple to middle white tissue, a smaller proportion of the genes were significantly correlated with anthocyanin content (22 out of 36 genes; Additional file 5.3). Finally, an even smaller fraction of genes were correlated with anthocyanin content when considering genes identified as DE in comparisons using only calli (32 out of 104 genes; Additional file 5.3). Of the 32 genes significantly correlated with anthocyanin content, 11 were consistently up- or downregulated in purple/green tissue across various calli and cultivar comparisons (Fig. 3). We were particularly interested in genes that were consistently up- or downregulated in the purple color-specific manner: namely, up- or downregulated in the purple tissue of the CH5544 taproot at 6-, 10- and 12-week-old and the Nightbird taproot, but not strongly differentially expressed in purple outer and purple inner tissue of the Superblack cultivar. bHLH-A (LOC108204485) was highly upregulated in purple tissue across almost all comparisons based on calli and taproots of various cultivars (Fig. 3). While the gene was differentially expressed in purple outer and purple inner tissue of the Superblack taproot, its logFC was much smaller compared to other comparisons. The expression of this gene was also significantly positively correlated with anthocyanin content (Fig. 4a). Correlation between the transcriptome abundance and total anthocyanin content for genes differentially expressed in a purple color-specific manner. The red-lines and grey-area represent estimated fit-line and 95% confidence region, respectively. The correlations are showed for: a bHLH-A (LOC108204485), b MYB3-like (LOC108208100), c MYB113-like (LOC108213488), d TRANSPARENT TESTA GLABRA 1 (LOC108224236). The MYB3-like gene on chromosome 2 (LOC108208100) was consistently upregulated in all purple calli or tissue samples, except for Superblack (Fig. 3; Fig. 4b). The transcriptome abundance of this gene was positively correlated with anthocyanin content. The RAX2 (REGULATOR OF AXILLARY MERISTEMS 2) gene on chromosome 4 (LOC108216892) and RAX2-like gene on chromosome 5 (LOC108221019) also exhibited similar patterns, although these genes were differentially expressed in Superblack. The MYB113-like gene, also known as DcMYB6, was previously demonstrated to be involved in regulating anthocyanin biosynthesis in purple carrot taproots . In the present study, the gene was also differentially expressed in a purple color-specific manner, although it was not detected as DE in Nightbird. The transcriptome abundance of this gene was significantly positively correlated with anthocyanin content (Fig. 4c). Similarly, TRANSPARENT TESTA GLABRA 1 (TTG1; LOC108224236) was also upregulated in the purple callus and purple tissue of the CH5544 cultivar across all ages, however it was not differentially expressed in Nightbird. The transcriptome abundance of this gene was also positively correlated with anthocyanin content (Fig. 4d). Relative Expression Changes based on qRT-PCR results were largely found to be in accordance to the RNA-Seq data, although with a few exceptions. In particular, bHLH-A (LOC108204485; Fig. 5a), MYB3-like (LOC108208100; Fig. 5b), MYB113-like (LOC108213488; Fig. 5c), RAX2-like (LOC108221019), RAX2 (LOC108216892), RAX2-like (LOC108208253) and bHLH113-like (LOC108197411) were highly upregulated across all purple callus/tissue samples, and the relative expression ratio increased in a color and age-specific manner. In a similar manner, bHLH137-like (LOC108225152) was consistently downregulated in purple callus and tissues, validating the results of the differential expression analyses. The TTG 1 gene (LOC108224236; Fig. 5d) was also found to be slightly upregulated in a color and age specific manner across all comparisons, except for the comparison between purple and orange callus. bHLH68 (LOC108213035) expression was found to be upregulated in purple as compared to orange callus, and outer purple tissue of all 6 and 12 weeks old taproots as compared to middle tissue; however, this gene was slightly downregulated in outer of 10 and center of 12 weeks old taproots as compared to the middle white tissue. Finally, MYB108 (LOC108200913) was consistently downregulated in purple callus, but upregulated in outer and center purple tissue of CH5544 in later stages. These results are summarized in Additional file 2.3. Validation of differentially regulated genes associated with the anthocyanin content by qRT-PCR. Data were normalized to the expression of glyceraldehylde 3-phosphate dehydrogenase (G3PDH) for each sample. P vs W indicates the comparison between purple and white calli, and P vs O indicates the comparison between purple and orange calli. 6WO, 10WO and 12WO indicate the comparison between outer and middle tissue for 6-, 10- and 12-week-old taproots, respectively. Similarly, 6WC, 10WC and 12WC indicate the comparison between center and middle section for 6-, 10- and 12-week-old taproots, respectively. The results are showed for the following genes: a bHLH-A (LOC108204485), b MYB3-like (LOC108208100), c MYB113-like (LOC108213488), d TRANSPARENT TESTA GLABRA 1 (LOC108224236). Our study aimed to identify important genes that function as positive or negative regulators in the anthocyanin biosynthesis pathways in carrots using RNA-Seq and qRT-PCR for validation. RNA was extracted from differently colored calli, as well as tissue samples from taproots of various cultivars across the course of development. Using the recently published carrot genome , gene expression levels of these samples were compared, and MYB, bHLH and WD40 genes that were consistently up- or downregulated in a purple color-specific manner were identified. In total, 104 MYB, bHLH and WD40 genes were differentially expressed. Using anthocyanin content measured from a subset of calli and tissue samples, the expression of 32 genes (out of 104 genes) were shown to be significantly correlated with anthocyanin content. Expression patterns of these genes were compared across various cultivars and different time points, and 11 genes (out of 32 genes) were consistently up- or downregulated in a purple color-specific manner. Finally, we validated 10 out of these 11 genes using qRT-PCR, demonstrating that these regulatory genes may indeed activate or hinder anthocyanin biosynthesis in black carrot. Our study has demonstrated that the R2R3-MYB transcription factor, MYB113-like gene on chromosome 3 (LOC108213488), was upregulated in a purple color-specific manner, and the expression of this gene was strongly positively correlated with anthocyanin content. This supports the previous findings of Xu et al. , that found that this gene (designated as DcMYB6) is involved in regulating anthocyanin biosynthesis in purple carrots. This gene contains the highly conserved bHLH-interaction motif and two atypical motifs of anthocyanin regulators, and shares high identity with anthocyanin-regulating MYB transcription factors from many other species . Our study also demonstrates that the basic helix-loop-helix protein A (bHLH-A; LOC108204485), which is homologous to TT8 in Arabidopsis, may act as a positive regulator in anthocyanin biosynthesis. To our knowledge, there is no documentation for the role of this gene in carrot anthocyanin biosynthesis. The bHLH-A gene has been shown to be upregulated in eggplant (Solanum melongena L.) peel, indicating that this gene may enhance anthocyanin biosynthesis . Hellens et al. identified that pea gene A, which is the factor determining anthocyanin pigmentation in pea (Pisum sativum), was closely related to the MtbHLHA gene in Medicago truncatula; this study also found that gene A and MtbHLHA are in the same clade as AN1 in petunia and TT8 in Arabidopsis, both of which are known to directly activate transcription of structural genes in the anthocyanin biosynthesis pathway [15, 52]. More recent studies found genes that are closely related to AN1 and TT8 also act as a positive regulator for anthocyanin biosynthesis in red radish (Raphanus sativus L.)  and ornamental cabbage (Brassica oleracea var. acephala) . In a separate study, we overexpressed AmDEL (bHLH), together with AmRosea1 (R2R3-MYB) from Antirrhinum majus in orange carrot cultivar Danvers 126 . These transcription factors (TFs) are known to affect anthocyanin pigmentation of snapdragon flowers, and ectopic expression of these TFs has been reported to induce anthocyanin biosynthesis in Solanum lycopersicum [56, 57]. The simultaneous expression of both of these TFs led to synthesis and accumulation of cyanidin-based anthocyanins in calli, shoots and taproots of orange carrot, whereas individual overexpression of either of these TFs did not result in any pigmentation. Our study confirms the presence of intact biosynthetic genes responsible of anthocyanin biosynthesis in orange carrots and absence of anthocyanins could only be attributed to a lack of necessary transcription factors. Furthermore, the inability of AmRosea1 and AmDEL in inducing anthocyanin biosynthesis individually confirms the requirement of formation of MYB-bHLH-WD40 (MBW) complex for activation of anthocyanin biosynthesis genes. TRANSPARENT TESTA GLABRA 1 on chromosome 6 (TTG1; LOC108224236) was also expressed in a purple color-specific manner, and its expression was positively correlated with anthocyanin content in the current study. A homolog to this gene is known to encode a WD40 repeat protein in Arabidopsis . Together with bHLH and MYB proteins, WD40 repeat proteins are required to form the MYB-bHLH-WD40 (MBW) transcriptional complex and activate the anthocyanin biosynthetic pathway. However, unlike bHLH or MYB proteins, WD40 proteins seem to have a more general role in the regulatory complex , and the TTG1 gene was expressed in its all major organs of Arabidopsis . In the current study, while the TTG1 gene was consistently differentially expressed in a purple color-specific manner, its log-fold change was generally low (Fig. 3). This, in combination with its moderate correlation to anthocyanin content, suggests WD40 may not be as crucial as the bHLH or MYB proteins detected in this study, although WD40 proteins are still required to activate the structural genes involved in the anthocyanin biosynthesis. The results of the current study indicate that a total of three RAX2 (REGULATOR OF AXILLARY MERISTEMS 2) and RAX2-like genes may also function as positive regulators for anthocyanin biosynthesis. RAX genes are involved in shoot branching in Arabidopsis [59, 60]. In particular, RAX2 controls axillary meristem formation during middle to late stages of vegetative development . All RAX genes are known to belong to the class R2R3 MYB family [59, 61]. However, the role of these genes on anthocyanin biosynthesis in carrots or any other plant species is currently unknown, and future efforts should be directed towards understanding the function of these genes in anthocyanin production. The bHLH137-like gene on chromosome 6 (LOC108225152) was consistently downregulated, and its expression was negatively correlated with anthocyanin content, indicating that this gene may act as a downregulator in the anthocyanin pathways. Currently there is no documentation of its role in anthocyanin biosynthesis in the carrot or any other root species. In Arabidopsis, the bHLH137 gene was reported as a DELLA-induced gene that may repress signaling of phytohormone gibberellic acid, and this gene is predicted to encode transcription factors . In other species, the role of this gene is not well understood. bHLH137 in Arabidopsis was shown to be closely related to genes involved in growth regulation, including the grapevine (Vitis vinifera) cell elongation bHLH protein (VvCEB1) ; there is a conflicting evidence that VvCEB1 may or may not play a role in cell expansion during berry development for grapevine [63, 64]. Finally, the MYB3-like gene on chromosome 2 (LOC108208100) was also shown to be upregulated in a purple color-specific manner across all time points and cultivars except for Superblack, and it was strongly correlated with anthocyanin content. MYB3 is a MYB transcription factor that is possibly involved in phenylpropanoid metabolism in Arabidopsis ; phenylpropanoids are a diverse group of compounds involved in plant defense, structural support, and survival, and the anthocyanin biosynthetic pathway is a major branch of the phenylpropanoid pathway. To our knowledge, the role of MYB3 is not well understood in carrot or any other root species. We have uncovered possible candidate genes that may regulate the anthocyanin biosynthesis pathways in black carrot. Transcriptomic data were obtained from differently colored calli, as well as taproot samples of various cultivars across the course of development. A total of 10 MYB, bHLH and WD40 genes were consistently up- or downregulated in a purple color-specific manner; the expression of these genes was significantly correlated with anthocyanin content, and the expression results were validated with qRT-PCR. Our results provide insights into regulatory genes that may be responsible for anthocyanin production in carrot, and suggest that future efforts could be directed towards understanding how these candidate genes regulate the anthocyanin biosynthesis pathways in this species. We would like to acknowledge Rikke Bækhus Jakobsen for technical assistance and Ole B. Hansen for taking care of the plants. The project was supported by Innovationfund Denmark, Grant number 4105-00006A. Data for this study will be available upon publication of the manuscript; until then, the raw data can be made available to researchers upon reasonable request to the corresponding author. MTPG and HBP designed and supervised the study. MK, SS, IBH, BJ, TD and DBA made substantial contributions to acquisition of data. Specifically, IBH has induced and isolated callus samples. SS collected taproot samples. MK, SS and DBA extracted RNA from callus and taproot samples. BJ and TD performed anthocyanin profiling, and SS performed qPCR validation. MK, FV and SL have contributed to analysis and interpretation of data. In particular, MK processed the RNA-Seq data and performed the analyses, and FV and SL provided guidance with bioinformatics analysis and interpretation of data. The first draft of the manuscript was prepared by MK. All authors have read, revised the manuscript critically for important intellectual content, and approved the final manuscript. All authors agreed to be accountable for all aspects of the work in ensuring that questions related to the accuracy or integrity of the manuscript are appropriately investigated and resolved. Andrews S. FastQC: A Quality Control tool for High Throughput Sequence Data. http://www.bioinformatics.babraham.ac.uk/projects/fastqc/. Accessed 1 June 2016.